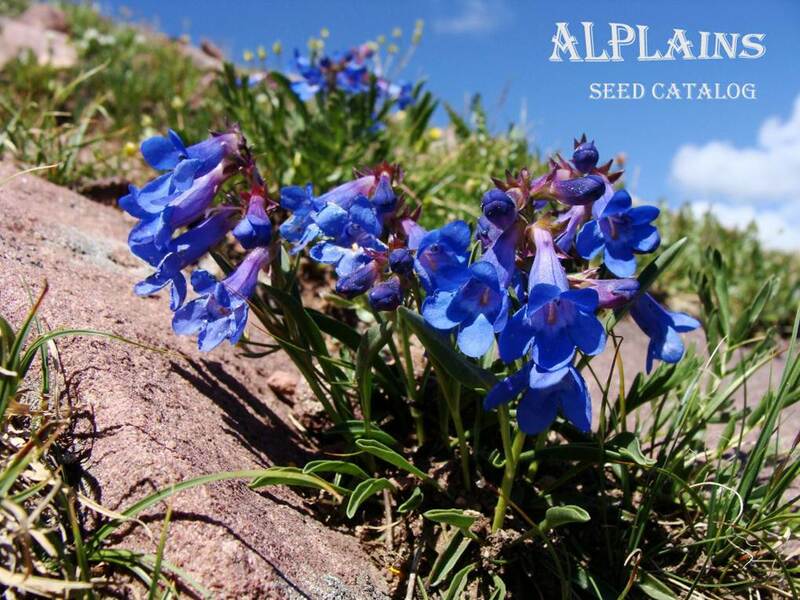 Photo above shows Penstemon uintahensis in all its alpine glory at 11,500 feet on Leidy Peak in the Uintah Mountains, taken in August, 2008. Welcome to our 29th annual seed catalog! 2018 was another busy season filling orders, although it was a bit slower than normal due to the fact that I was unable to make my annual fall trip last year to California and the Pacific Northwest because of numerous late-burning fires. As a result, I could not collect many Lilium and Dudleya seeds which many of my customers love. Fortunately, I had plenty of other species to offer and sales were enough to keep me going. Thank you again for your continued support! The winter of 2017-2018 dropped very little snow and rain throughout the western states. Most of the moisture fell on the Pacific Northwest with Montana receiving record snowfall amounts. During my annual trek to Tucson for the Gem and Mineral Show in early February, it was pretty obvious the southwest deserts had not received a whole lot of moisture either. After the wild spectacle of 2017, I guess the deserts decided to rest. It may be years before that happens again. In early April, my wife Claudia and I decided to take a trip to the desert areas. She works long hours as a supervisor and was anxious to take a trip somewhere just to relax and unwind. So we shopped around Santa Fe, hiked around Cave Creek in southeast Arizona, toured Kartchner Caverns and visited Tombstone. We milled around the Old Town Galleries in Tucson and then took the Kit Peak Observatory tour southwest of Tucson for some out-of-this-world sights. The next day we hiked around Sabino Canyon and also took the tram ride all the way up into the canyon. This is a spectacular canyon with huge cliff-walls and great scenery. During our return trip, we shopped around the Old Town of Albuquerque. We picked up our two cats from the pet spa who were happy to see us but were a little miffed at having to spend a week in an unfamiliar place. The next day a storm hit our area, rain, lightning, thunder in spades followed by a dumping of several inches of snow. This was one of several late snowstorms to hit the Colorado area since early March, so perhaps spring could be saved after all. Still, as I was later to find out, it was not enough because of the tepid response from the local flora. My first botanical trip started in late April into early May around the Moab, Utah area. I was delighted to find out that the canyon lands must have received abundant moisture during the winter months. I explored a number of unnamed canyons near Moab and found hillsides covered with Penstemon utahensis, their carmine spires glowing in the sun against the pink and cream sandstone slopes, Fendlera rupicola with its fragrant white stars bursting out by the thousands, Penstemon eatonii v. undosus blooming near the canyon bottoms with its ripply leaves and Allium macropetalum sprouting here and there on level sand mesas. Mahonia fremontii with its blue Holly-like leaves and yellow flowers and Fraxinus anomala were scattered sporadically in various canyon hillsides. Clumps of Echinocereus triglochidiatus with their bright red-orange trumpets could be found occasionally growing on huge rock piles near canyon bottoms. I also found a population of a plant I haven’t seen before, Lomatium latilobum, their yellow flowers heads turning to seed already. I’m sorry I missed the height of their bloom but I did get seed later. I was also thrilled to discover Yucca baccata and Yucca nana were getting ready to bloom as I saw on a return trip about a month later. I have been waiting to collect seed of these great Yuccas for several years. Farther south near Bluff, it was too dry for Talinum brevifolium to even bloom. On May 31, my daughter Emily and I attended a concert at Red Rocks, a natural amphitheater set high in the foothills near Denver, to hear Natasha Paremski play Rachmaninoff Concerto #2, one of my favorite pieces of all time. It was a magnificent performance and we enjoyed ourselves immensely, as did a few hundred other attendees. I also noticed the lavender spikes of Penstemon secundiflorus blooming by the thousands all around the foothills roads which provided abundant seed later in August. In early June, I took my first trip of the season to California to check on conditions there and to see if seed of some early bloomers might be available. I was finally able to collect a decent amount of Erythronium helenae from the Mt. St. Helena area, along with Delphinium nudicaule with its red flowers held out on long pedicels. Further north, I discovered a population of Calochortus monophyllus with its brilliant yellow, nodding flowers blooming by the hundreds. It is unfortunate that I could not return in time to collect seed. Calochortus coeruleus, on the other hand, was very sparse. Northern California and southern Oregon received barely half of the average amount of moisture but many of the plants bloomed rather well. Seeds of Erythronium citrinum v. roderickii were the least abundant but I managed to collect decent amounts of Asarum marmoratum, Erythronium hendersonii, E. citrinum, Lewisia oppositifolia and Trillium rivale. Pedicularis densiflora and Erythronium oregonum v. leucandrum were also fairly abundant. Later, up in Washington state, I found a few seeds of Anemone oregana and Lewisia tweedyi. Coming down through Idaho, Erythronium idahoense had bloomed very well indeed. Dodecatheon cusickii was less enthusiastic but still yielded a modest amount. For those of you who have been following my travels for years, you will probably recognize all of these species, so this was essentially a maintenance trip, trying to restock seeds that have been popular in the past. Exhausted after this trip, I rested at home for over a week before venturing out again. Emily expressed a desire to go hiking so we decided to trek up to the Devil’s Causeway in the Flattops area of Colorado. The Causeway is a spot on one of the mesas where the basalt has eroded on both sides to a width of only three feet at the narrowest point, with sheer drops of hundreds of feet on both sides. Not for the faint-hearted. We did some botanizing as well, discovering a whole lake covered with Nuphar luteum, the local yellow-flowering water lily. I don’t know who would be interested in growing these given the unique habitat and besides seed is nearly impossible to collect without a boat. In early July, heat was starting to build across the nation. I took a few day hikes up into the local foothills and discovered that despite all the late rain and snow of spring, much of the montane and subalpine flora did not bloom well at all. Apparently winter snow cover is necessary for good floristic performance. Nevertheless, I managed to collect some Heuchera hallii and a few other special seeds. In mid-July, my wife and I took a short, 4-day trip over the Beartooth Highway spanning the Absaroka Mountains of Wyoming and the Beartooth Mountains of Montana. She has heard me and others talk about the spectacular scenery from the Beartooth Plateau so she finally arranged enough time off from work so she could see it for herself. I also managed to collect a few more seeds like Mertensia viridis, Townsendia parryi and Delphinium bicolor. Temperatures were now regularly exceeding 100° F. across most of the nation so I figured more fires were going to break out everywhere. Indeed, many areas in Colorado and California were already burning but the worst was yet to come. Nevertheless, I ventured out on another trip across the Pacific Northwest. Western Colorado and most of Utah (except for the Moab area) were very dry and I could not find anything worth collecting until western Utah where somehow Penstemon nanus and Oenothera caespitosa v. crinita had bloomed fairly well. But a few miles farther, in eastern Nevada, it was horribly dry, scuttling plans to collect Astragalus utahensis, Erigeron uncialis, Salvia dorrii, Phlox tumulosa, Fritillaria atropurpurea and a few other species I had seen in the past. I was also desperately looking for Asclepias cryptoceras, having struck out in Colorado and Utah. I found a few pods in central Nevada and not much else. Reaching the Sierra Nevadas of California, I managed to collect some more Allium platycaule and A. peninsulare but the heat and dry conditions were scary. I was very careful as always driving on back roads and especially parking with a hot engine. I made plans to collect Erythronium multiscapoideum (the hardy, dwarf version) in the mountains west of Redding when I heard about a fire in Whiskeytown. It turns out a tire had blown off a trailer and the metal rim sparked on the pavement which was caught by the very dry and hot brush (it was 108° F.) and the fire took off like a whirlwind. The road was already closed by the time I arrived so I had to find a longer route the next day. Not only was the Erythronium collection successful but I also found some Allium campanulatum and Allium hoffmanii seed as well. While returning to Redding, I and a lot of other motorists were gawking at the scene near Redding from our vantage point up in the mountains. It looked like a couple of atomic bombs had gone off, huge mushroom clouds of smoke, billowing out as the smoke reached the upper atmosphere. The east side of Redding was still functioning so I decided to stay at the Super 8 near the freeway but the scene to the west was angry red and the air filled with smoke. I anxiously watched TV where all of the channels were showing pictures of the conflagration (now named the Carr Fire) overtaking Whiskeytown, Shasta and western suburbs of Redding. I was half expecting to hear evacuation orders during the night. One of the television stations suddenly declared on the air that they had to evacuate immediately. After a fitful night of sleep, I learned the next morning that the entire subdivision of Keswick on the west side of Redding had burned to the ground, over 500 homes and businesses gone in a single night. So I got out of there as fast as I could and headed up to southern Oregon where the smoke was very thick but at least no towns were in danger at that point. Despite these conditions, seed of Fritillaria recurva, F. eastwoodiae and Asarum hartwegii was available, although in smaller quantities. Erythronium klamathense on the other hand didn’t even bloom. It wasn’t until northern Oregon that the smoke had cleared and I was able to climb some of the coastal mountains and collect Trillium ovatum, Allium crenulatum, Fritillaria affinis and Erythronium revolutum. Up near Yakima, Washington, Salvia dorrii v. carnosa had bloomed fairly well and set quite a bit of seed. After another exhausting trip and ordeal with the fires, I returned home by Aug. 2. On August 6, a massive hailstorm hit Colorado Springs and pounded the zoo on Cheyenne Mountain, the Broadmoor and the town of Fountain. Some birds in the aviary at the zoo were actually killed by the onslaught, thousands of homes and cars were damaged and the streets were white with several inches of hail. I took a short trip to central Wyoming and was disappointed to find that Phlox pulvinata (blue form) had set no seed at all again, like last year. On the flip side, I was delighted to find the Laramie Peak area was overflowing with seed, including the precious Aquilegia laramiensis and Wyethia scabra. Up in the Big Horns, however, conditions were much worse. I could find no Pulsatilla patens and very little Aquilegia jonesii. At least there was plenty of Delphinium bicolor. Subsequent short trips later in August in Colorado and Utah provided Physaria alpina, Aquilegia caerulea, Penstemon palmeri, Aquilegia caerulea v. ochroleuca and a small amount of Mertensia arizonica. Near Moab, however, collecting was still the best, with quite a bit of Yucca nana, Y. baccata and Fendlera rupicola seed finally mature enough to harvest. The last week in August found me in southern New Mexico, checking what the monsoon rains had brought forth. Ungnadia speciosa, Aquilegia desertorum and Primula rusbyi were the best collections, although the Primula was a bit immature so I am awaiting germination results before releasing it. The San Luis Valley provided plenty of Asclepias hallii seed despite the dry conditions there. On Sept. 3, Pike’s Peak received several inches of snow which is a little early, and then the first cold front of the season dropped more snow over many of Colorado’s mountains over the next couple of days. On Sept. 5, I went down to Colorado Springs to celebrate my father’s 90th birthday. He is still doing rather well, may he live to be 100! The following week, another heat wave blasted parts of the nation, including Colorado and lasted over a week. Another trip to southern Wyoming yielded Argemone hispida, Zygadenus elegans, Erigeron melanocephalus, Clementsia rhodantha and Mimulus lewisii. Early October started out very wet as the remnants of Hurricane Rosa raked across much of the West. I checked out the Kelseya uniflora populations in central Idaho and found very little bloom had occurred and hence little seed. Petrophyton caespitosum seed was abundant however as well as some Leptodactylon watsonii. The last time I offered this one was back in 2005, and before that, 1995. I zipped over to central Washington hoping to collect some last-minute Erythronium montanum and found many of the plants covered in snow. Nevertheless, there were enough remaining stalks poking through the snow to yield a decent amount. I looked for Xerophyllum tenax in Oregon but found no flowering stalks. Southern Oregon, though, was a genuine surprise. The smoke was now gone and I discovered the Liliums had bloomed much better than I would have expected. The pure Lilium bolanderi population still had quite a bit of seed remaining in the pods despite the late date. I also found what appeared to be a Lilium bolanderi hybrid swarm, which unfortunately I have not seen in bloom. But there are several regular-sized plants around and then there are three larger plants in the same area. Lilium rubescens and Lilium washingtonianum occur on nearby mountains so they could be possible parents. I am offering seed from this group as L. X bolanderi. I also noticed the Epilobium rigidum populations bloomed well and were in full seed, so this wonderful Siskiyou native is back on the list again as well. Farther down the coast, I picked up more seed of Dudleya caespitosa, D. farinosa and D. palmeri. I’m grateful the fires weren't burning here like last year. As mentioned last season, I decided to discontinue publication of the printed catalog. I did issue a letter to all customers the year before and I think by now all of my customers have gotten the message. I’m grateful many customers have continued to follow me on the website alone and to continue supporting me in my endeavors. I am now 65 and am facing a decision whether to retire from the seed business in the near future. In the absence of a successor or a buyer for the business, I will continue to offer seeds from all of the inventory remaining for as long as the demand lasts. My health is definitely declining and have trouble with extended periods of driving and collecting so necessary to maintaining a decent seed selection. Plus my father is now 90 and his health is declining even more rapidly, so I need to keep a watchful on him. In late 2011, I had the great honor to receive the Marcel Le Piniec award from the North American Rock Garden Society for "enriching and extending the range of plant material available to American rock gardeners." It has been a privilege to collect seed and introduce to the horticultural public many new species of plants. My customers are the cognoscenti of the horticultural world and are a wonderful group of people who have shown me nothing but kindness and encouragement in my endeavors. Thank you sincerely for all of your patronage and support over the years! We also continue to offer seed from the extensive cactus and Yucca collections of Jeff Thompson, an expert in this area for over 30 years. Now numbering nearly 200 different kinds, they can be identified by the "JRT" (field) and "TC" (cultured) numbers in the listings. We also thank Donnie Barnett for a selection of Opuntia seeds, indicated by "DB". The twelve main seed catalog pages list ALL collections that are available for sale. In the interest of saving myself considerable computer time, I am no longer maintaining the "New Items" pages and I apologize if this causes anyone some inconvenience. Items listed on the "Archives" pages are NOT AVAILABLE but are listed there for your reference. When a collection sells out, it will be moved to the "Archives" pages. The 2015 catalog was the last printed catalog issued by us. For the 2016 season, there was a mailing with a cover letter announcing the end of printed catalogs along with a synopsis of my travels and a list of new collections made in 2015. After this, there are no more general mailings. All collections will be maintained on the website only from now on. For your reference, previous printed catalogs are available for $3.00 each. Issues available are: 1994, 1995, 1996, 1997, 1998, 2001, 2003, 2005, 2006, 2007, 2008, 2009, 2010, 2011, 2012, 2013, 2014, 2015. Our Photo Gallery continues to grow. We will be uploading many more photos in the weeks and months to come. Stay tuned and watch our website grow! This entire website is protected under copyright law and no part may be reproduced by any means without written permission of ALPLAINS.